Carnival Cruise Line – The World’s Most Popular Cruise Line® – will kick off its 2019 West Coast expansion plans on New Year’s Day with its first-ever float in the world-famous Rose Parade as part of a year-long celebration of its first new ship to homeport in California in 20 years that will arrive in December 2019. 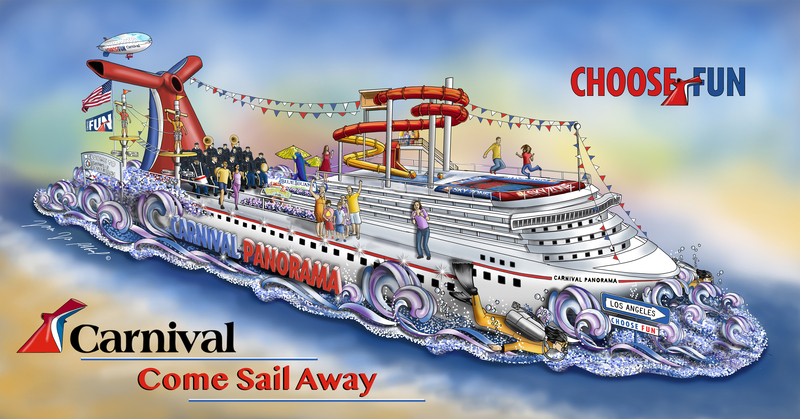 As it prepares for the arrival of Carnival Panorama in Long Beach next December, Carnival will preview a floral replica of the ship to 700,000 spectators on hand to view the 130th Rose Parade in Pasadena, Calif. on Jan. 1, as well as a worldwide television audience of more than 80 million parade fans. The float will include many of the signature features of Carnival’s ships – including the red and blue funnel, a water park and Lido Deck party – as well as the line’s newest fun feature, and first-ever trampoline park at sea, in partnership with Sky Zone. Comprised of tens of thousands of flower petals meticulously applied by hand, the 55-foot-long float will sail the five-mile parade route and show off signature touches, such as flowers from more than 100 countries to represent the number of nations that Carnival employees hail from, snorkelers enjoying a shore excursion, and a RedFrog and a BlueIguana from their namesake poolside watering holes. Additionally, as a replica of the Carnival AirShip flies over the float, fitness enthusiasts will be jumping into the fun on a Sky Zone trampoline built directly into the front of the float. Celebrating its role as the cruise line that carries the most military personnel, the float also salutes the brave men and women of the Armed Forces with a special appearance by Former Miss USA, Deshauna Barber, godmother of Carnival Panorama’s sister ship, Carnival Vista, and the first active member of the military to serve as Miss USA. Every Carnival cruise includes a special onboard tribute to honor guests that have served or currently serve in the U.S. armed forces.